Winters been brutal and so you start ...poking around, exploring BMX history to keep your mind nourished with BMX stuff. I just stumbled apon the story of the Jay Miron prototype this year. I'm mainly the SKYWAY guy here so, just didn't know. But I always look back at my fav riders and all things related to SKYWAY. Hense an interest in HARO/HOFFMAN/SCHWINN etc. I'm curious as hell...anyone know the where about of the PUNISHER prototype and if only one was made? Adam Dawson come on down!. Your the first contestant on "WHERE THE HELL IS THAT BIKE" lol. whereabouts are unknown. i tried contacting jay a few years back about it but he never got back to me. there was only the one frame. shane welded it up. it was actually gonna be a trans purple just like the big daddy that day smith had in 95, but the painter couldnt get it right, color ended up being a mega bright purple, like 80s bright purple and jay REALLY didnt like it so they painted it black. If I remember,I can ask Jay about it if we run into him again on our local museum rides. So, I read in one of the pic captions that the bike was a dark blue/black. Is that wrong? Anyone have pics of it? I love building bikes just so I can go scratch them..
Keep it up Steph I think you're on your way to Hoffman therapy! First few pics (not the green spokes) are the Punisher. Hey did ya ever talk to Jay about the PUNISHER? Not yet.But word has it that he might make a appearance at the local 3rd annual bmx show.I can ask him then. I most likely will unless I drink way too much or smoke above my limit of marijuana. Jay took it when he went to Schwinn. There's lots of pics showing him riding the bike with big down tube Schwinn decals on it. And yes, Schwinn copied parts of the PUNISHER frame design. 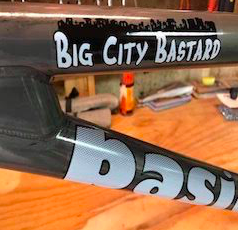 The whole tapered rear top tube where it flattens out is all PUNISHER. And do show me pics of the Punisher with Schwinn decals! Never seen them! Imagine if Jay still has it! I wouldn't say that Schwinn copied anything. Miron took that top tube design from his Hoffman days all the through to his first MacNeil frame. Hmm. I guess I never realized that the first bike Jay rode for Schwinn (and got a lot of coverage with) was the HB proto, with big red Schwinn stickers. Bottom of Page 1, adamdawson again with the HB goods and history!! Sure..but it started with the PUN8SHER. Started when he was at HOFFMAN. If Jay designed it, he had the right. If he "took" it...that's a different story. Jay's one of my favourite riders of all time, but there seems to be more reasons he's called "THE BEAST" LOL. Stories exist of, shall we say, strange, occurrences ?lol. Still think he's one of BMXS best ever. I found some of the written contents to be pretty funny.